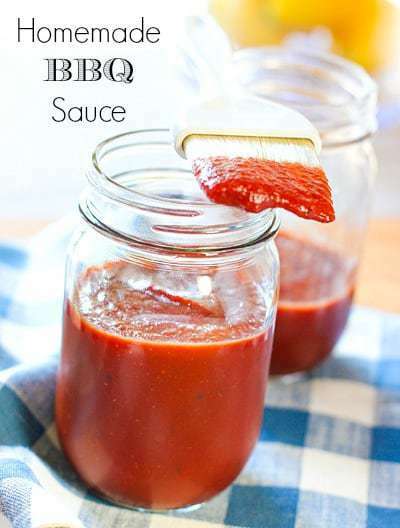 Have you ever read the ingredients on the back of your favorite store bought BBQ sauce? Ick. I love me some sweet, tangy store bought BBQ sauce but on the top of the ingredient list is high fructose corn syrup. Darn, darn, and double darn! That would explain why I am so happy when I dip my spoon in it…all that sugary stuff running through my veins…and as you know, if it feels good, you probably can’t do it, or eat it or dip stuff in it. This is a fabulous home made version, and tastes even BETTER. A worthy subsitute! It was hard finding a recipe that didn’t include ketchup. I mean if you are going to add two cups of ketchup you might as well be slurping up the Sweet Baby Rays! Don’t let the ingredient list intimidate you. I’ll bet you already have most of it on hand. You may not have liquid smoke in your cupboard. (I did, but I am a super food dork). You can leave it out but increase the honey by 2 tablespoons or substitute a minced chipotle pepper for some added smokey flavor. To fresh and fast condiments! 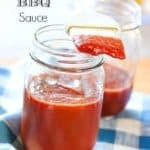 Easy Homemade BBQ Sauce! No more preservatives or over sweetened sauce! Pour all ingredients in large saucepan and whisk. Bring to a simmer and cook for about 10-15 minutes until sauce is thickened. Will keep in refrigerator for up to one week. Yes! You certainly could. Your sauce will most likely be a bit sweeter but I like it that way! Thanks for the help, my hubby will be so pleased with a sweet sauce ! Yippee! That sounds really good and I’m going to try it out, thanks!